Sleep apnea is a sleeping disorder that results in a disruptive sleeping pattern. If you have sleep apnea, you may experience pauses in breathing while you sleep, until your brain registers elevated levels of carbon dioxide, signaling you to wake up and breathe. You may wake up choking or gasping for air. This can happen 5 times an hour, or even a hundred times during a full night of sleep (or lack thereof). As a result, you may be unfocused during the day, agitated, irritable, or likely to fall asleep when doing mundane activities like watching TV or reading. If you have already been diagnosed with sleep apnea, you may be living with the pain of a CPAP machine. The noise often keeps you awake, as well as anyone in the room with you attempting to sleep. You are restricted to sleeping in tight range of the noisy machine, and the mask is simply uncomfortable. For many patients suffering from sleep apnea, the CPAP simply doesn’t work! The Center For Dental Excellence offers an alternative solution to the traditional CPAP machines that are loud and uncomfortable. 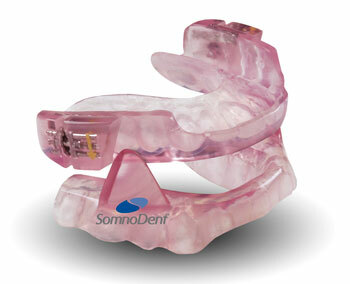 We offer Somnadent’s Oral Appliance Therapy, or a mouth guard, you wear while you sleep. The mouth guard is custom fitted to your mouth, designed to keep your airway open. It is comfortable, gives you a full range of motion while sleeping, and it also prevents snoring! Schedule your initial exam today to find out if you are a candidate for this alternative to CPAP.